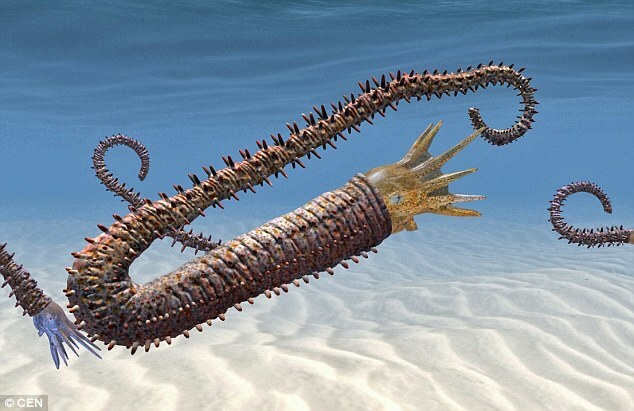 Scientists have managed to re-create the appearance of a previously unknown fossil – a spiky creature thought to be the ultimate ancestor of the modern-day squid and octopus. The Austria National History Museum team used 3D scanning technology to unearth the fossil of ‘Dissimilites intermedius’ a layer at a time, and then created a video of how the creature lived and moved. The ammonite was discovered in sediment which formed at the bottom of the ocean during the Cretaceous period – on a surface which, 128 million years, later would lie at the top of the Dolomite mountains in the Alps. The scientists said that the computer tomography had allowed them to see far more than they would ever have been able to with the naked eye, with the creature was exposed a layer at a time. They also discovered the body was covered with spines each between three and 4mm long. A museum spokesman: ‘The fossil is of a previously unknown creature which is a type of Ammonite. 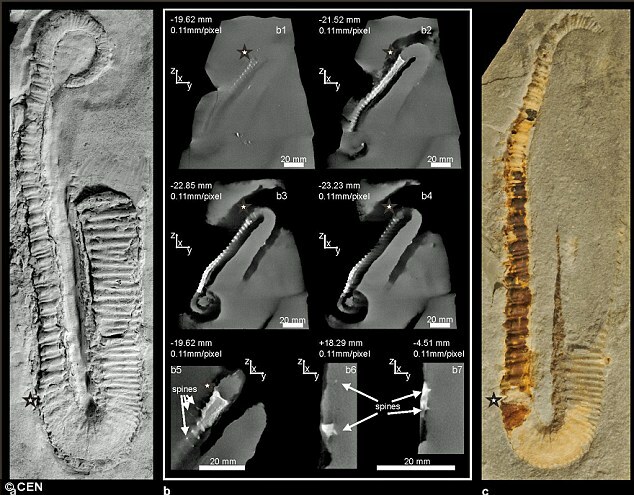 The video of the swimming creature seen now for the first time in 128million years is on display at the Natural History Museum together with photos of the 13cm-long creature. The spokesman added that the prehistoric Tethys Ocean, which existed between the continents of Gondwana and Laurasiam, had left behind millions of years-worth of sediment at the bottom of the sea. Gondwana would break up to form much of the Southern Hemisphere, and Laurasia would form much of the Northern Hemisphere. 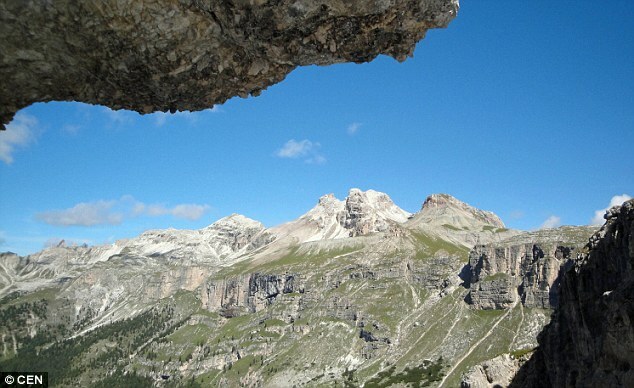 As the centuries passed and the Alps folded out of the sea, some of the former sea bottom sediment ended up on the peaks of the Dolomites. And it was here in the Puez-Geisler-Natural Park, at a height of around 2600m, that a section of the former seabed was discovered – with the thickest density of fossils from pre-history yet discovered. 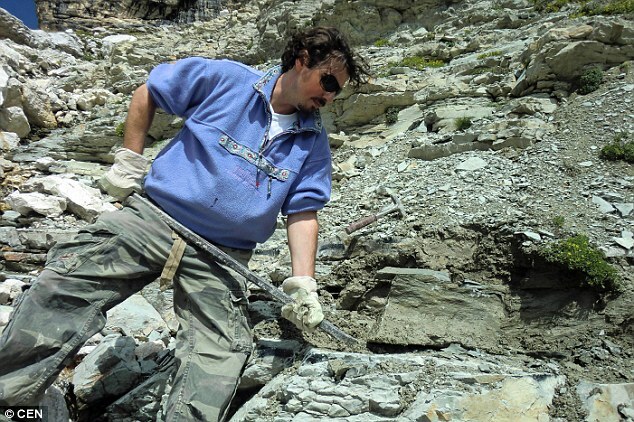 The team, led by Alexander Lukeneder from the geological/palaeontology section, has been working on the 150metre section for three years, and discovered the fossil of the ammonite last year. Details of the final published in the specialist magazine ‘Acta Palaeontologica Polonica’.